For parents who are looking for a compact and lightweight convertible car seat, Combi Coccoro Lightweight Convertible Car Seat is a great choice for you. It is available in several colors, including Cherry Pie, Licorice, Keylime and Carrot Cake. It is small enough that one can fit up to 3 such seats in a row on the back of most vehicles. 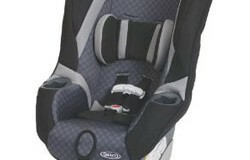 This makes it a great car seat choice for smaller, fuel efficient cars. Since it is small, it is lightweight too, just weighing 11 pounds and is compact at only about 15 inches wide. This car seat is ideal for the nature-friendly expanding family. It offers good security for your kid and is also comfortable. The 5-point adjustable harness with chest clip provides security for the child. The cover is well padded using a waffle weave fabric which is crucial for both comfort and also side impact safety. The seat size of the car is rather mixed bag. It is designed for easy and quick installation into the vehicle. Since it is adjustable, this means that it can accommodate the child’s growth and yet be still effective. 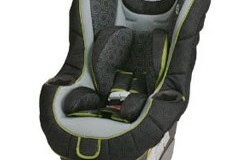 The adjustable infant insert allows positioning of a child at the recommended angle of 45 degrees. 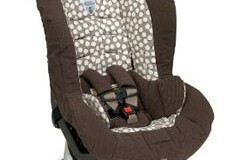 It has got storage loops which keep the harness to the sides while loading or unloading the child. The 2 storage pockets are convenient. The seat cover can be washed using a machine on gentle cycle. The chest clip is IMMI styled. The harness can be washed using a mild soap and a moist rag, but it cannot be removed without the use of a screwdriver. Its size helps with easy installation and makes it unsuitable for bigger children. Installation is quite straightforward once one figures out the rear-facing beltpaths. This is simple as everything is color coded, red for forward facing and blue for rear facing. There are stickers available with instructions and diagrams for every installation aspect, including the LATCH connectors are hooked and removed. It is capable of holding kids up to 40 inches in height. This means that it can hold kids who are about three feet tall. Therefore, while one may still have plenty of room even with this car seat installed, they may get limited use from it once the child really starts growing. Coccoro is offered with a limited one year warranty. Summary : It is a compact seat with average rating from NHTSA.